Successfully Added In-Dash Car DVD Player And TFT With USB And SD Slots + TV + FM to your Shopping Cart. Advanced All-In-One Car DVD / Stereo with widescreen format TFT screen, USB and SD Card slots, a detachable panel for safty, and TV Tuner. Region-free DVD player with full on-screen menu. Fits in standard in-dash DIN-1 stereo slot. Comes with all necessary cable connectors for installation in most vehicles. Free car-mountable TV antenna included with every box. Remote Control and Instruction Manual included. Solid build quality and smart appearance, with dark colours to blend into your car dashboard. Intuitive front-panel controls for DVD chapters etc and volume control knob with click select. Built-in colour TFT display in the front panel. MP3 playback from USB devices such as MP3 Player, connected via USB. This versatile car stereo also has an SD/MMC flash memory card slot. The USB and SD/ MMC slots are in the top of the hinging front panel. Video and music DVDs and CDs can be inserted into the drive slot hidden behind the front panel. Naturally this cool car entertainment solution also features a radio with 30 presets and auto channel scanning. An additional benefit of this great Car Video-Stereo is that it can easily be connected to a wide variety of other Car Entertainment Devices, e.g. sending the video to additional monitors, displaying video input from a reversing camera or GPS, easily connecting to a car amplifier system, etc. Remote control for DVD player, battery included. Full quality retail packaging - front panel comes in a protective case to guard against damage in transit. Will this work in the USA? 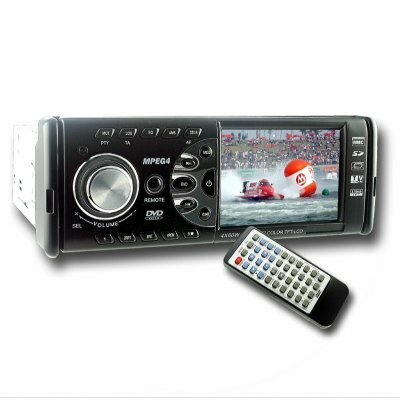 -Yes, the format is standard ISO DIN, the DVD player is region-free, and NTSC will be selected for you by Chinavasion. -Please note PAL will be selected for the applicable regions, but SECAM is not supported. Can you tell me exactly how to install this in a [XYZ Model of Car] ? -Please note that as Chinavasion.com is a wholesaler, we cannot offer detailed advice for end customers on how to install car electronics products. Please consult a car electronics specialist if you are unsure about how to answer your customers installation questions. Does this product have GPS? -Not included. However if you have a GPS unit you could connect it to this device to use the screen as an additional display. Does this product have RDS? Does this product play DivX movies burned on CD or DVD? -Currently not supported. It will however play a CD of MP3s. What is the brand of this DVD Player? -It is not branded as it is straight from the factory in China. If you are interested in putting your own brand on the product, please order samples first and then contact Chinavasion for a quote. Single item samples are available for delivery worldwide. The shipping costs depend on your location and the quantity you buy. Please register for a Chinavasion buyer account, login, and use the online checkout system to preview shipping options and costs. If you need price quotations for large quantities (Over 150 pcs of this device) please order samples first. After you have received your samples and confirmed the product is suitable for your market, we will be happy to quote even more competitive prices for larger orders. This product is FCC and CE compliant for export markets, as are all Chinavasion electronics products. Drop-shipping available to all members. See the Knowledgebase for details.